Do you share your stash with anyone? Your valuable and precious things! But in the game of Stash of the Titans the magical warriors share with you their stash. Stash of the Titans was released in 2011 and now lately has got its mobile version for you to play at your own convenience. Powered by Microgaming it has excellent mobile graphics and sound with funny animations and characters to make you feel the real life experience. This game can be accessed in a flash version and those playing in mobile casinos will appreciate the HTML5 mobile version of the game. The special symbols are the Stash of the Titans Logo and the Medusa symbol. 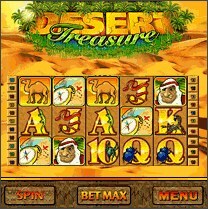 With a concept of 5 reels and 20 pay-lines this game will let you hooked quite quickly. Your chance to win some massive prizes, though not progressive, along with free spins feature in this game will definitely keep you playing. Betting wise, you will be able to pick a reasonable, diversified range of coins and total wagers to use when playing. Coin denominations can vary between $0.01 – $0.20 and the size of your total wager can be as little as $0.20 per spin or as high as $40 per spin. That means the Max Bet is 10 coins per line, which adds up to 40 coins per spin. 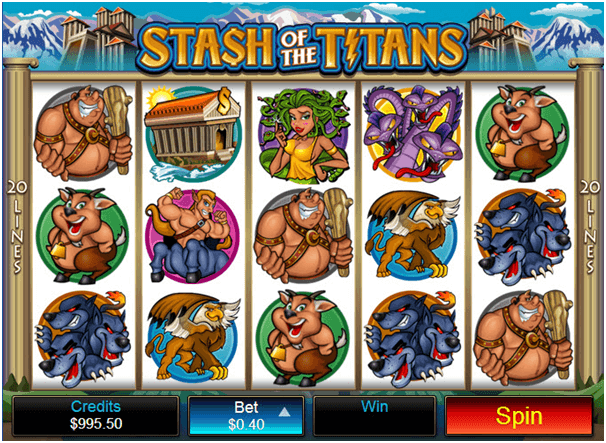 With easy to navigate features and buttons you will find it easy to play Stash of the Titans with your mobile device. The most important button in the game, well apart from the ”Spin”, is the ”bet” tab. Simply tap it with your finger and you’ll be able to adjust the bet sizing for the following spin. You’ll also find two tiny displays showing how many credits are still left in your account as well as how much you’ve won in any particular spin. To check the paytable, simply press on the ”20 lines” located on the right side, next to the first reel. This will open up the information centre with values of various credits along with some hints on how different features can be triggered and activated. Once you feel comfortable enough to start out, simply press the red ”Spin” button, which will roll the symbols on reels right away. You can disable the background music and animations if you prefer to play without game sounds. The other personalization options in Stash of the Titans online pokies include a Quick Spin option, the ability to play full screen, as well as an Expert mode which features an Auto Play function. With only a couple of buttons for you to use, you can make any adjustment of your choice and enjoy the game. The Wild symbol is the Stash of the Titans logo, which substitutes for every symbol except the Medusa symbol. When the Stash of the Titans logo helps complete a winning payline it pays out a multiplier on top of the payout. One Wild symbol in stash of the Titans pokies pays a 2x multiplier. Getting two, three, four or five Wild symbols activates a 4x, 6x, 8x and 10x multiplier respectively. The Medusa is the scatter symbol. This machine is slightly different as the scatter symbol can be in any location except on a winning payline to activate. Spinning two or more of this symbol will pay out a multiplier of your original bet up to 50x for five Medusas. Three or more Scatter symbols will activate the free spins bonus in Stash of the Titans online pokies. This bonus rewards players with 15 free spins, and all payouts have a 4x multiplier. This bonus cannot be re-triggered. No progressive jackpot can be won playing Stash of the Titans mobile pokies game, but you can still claim a non-progressive, fixed coin jackpot, which is quite ”heavy”. Claim up to 200,000 coins during the free spins mode, when 4x multiplier is applied, or up to 50,000 coins during regular play! Seeing how highest coin denomination is $0.20, the maximum win in this game is $50,000! 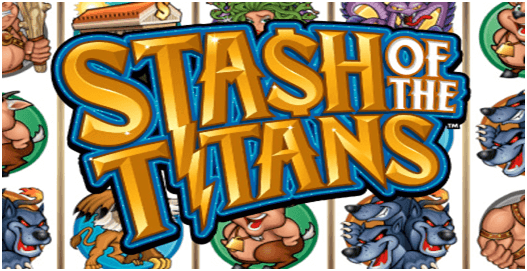 You can play Stash of the Titans at the following mobile casinos of repute.